100 paintings in 100 days personal challenge ! 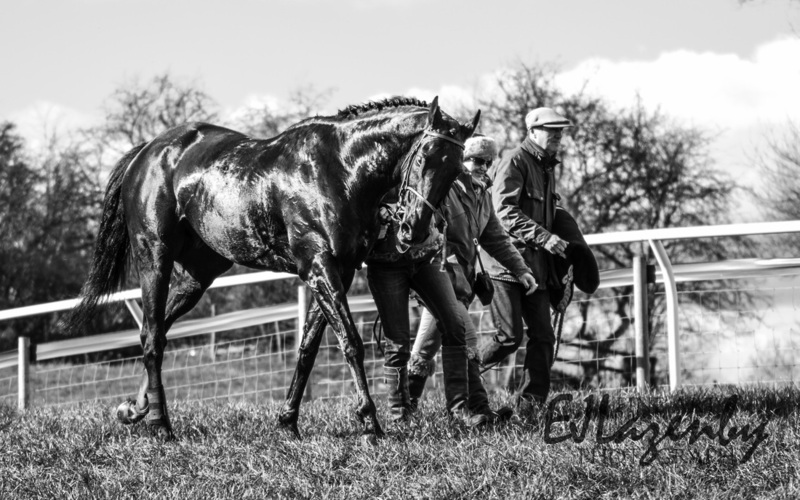 Please have a look in my galleries which not only contain my equine work, but also feline, canine and the odd human portrait or two! I am happy to accept commissions to create a bespoke piece of art from your own photographs... please contact me for further information. I am also a keen photographer and over the last year I have won numerous awards both Nationally and Internationally through BPE and FIAP exhibitions. 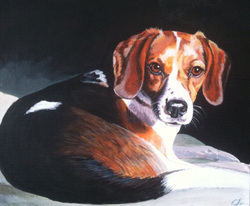 I am able not only to paint your animals, but to also create a photographic portfolio of images either as a stand alone, or as reference for paintings or drawings. Selected for the UKCPS London International! ​Great news! My latest coloured pencil drawing 'Child Of The Dawn' has been selected by the jury for the UKCPS Open International at the Menier Gallery in London. It is my third time I have had work that is deemed of a high enough standard to represent the UK Coloured Pencil Society! I can now officially use the letters 'UKCPS' after my name as a Signature Member of UKCPS. How special do I feel!!??! The piece shows my young daughter Lena with her Great Great Grandfathers old miners lamp. I'm delighted to report that I have won another award! I'm giggling as it is the fourth year I have entered The Annual Association Of Animal Artists Exhibition at Castle Park, Frodsham, and it's the fourth time that I have been lucky enough to win an award.... There are some fabulous artists who exhibit there, and the judges are different every year, but I am always surprised and delighted. The prize winning image is my big coloured pencil drawing 'Quiet Waters' of two Canadian Geese, this piece was also selected for exhibition last year at The Open International UKCPS at The Menier Gallery in London, so it has worked very hard for me! This piece is still looking for it's forever home, so if you think you could enjoy this piece on your wall everyday, please do get in touch! A little bit of Point to Pointing does you good! 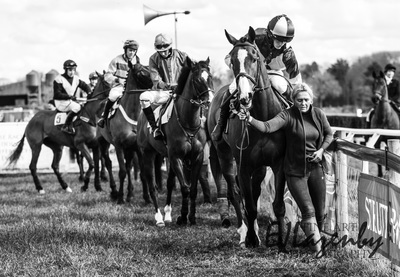 Some lovely Spring sunshine warmed my back at the West Of Yore Steeplechases Point to Point. As usual I had the camera over my shoulder looking to catch a few reference images for future paintings.... Here's a small sample of what I captured..... I'm inspired to get both my Indian inks and my trusty oils out and to get some new work on the easel. 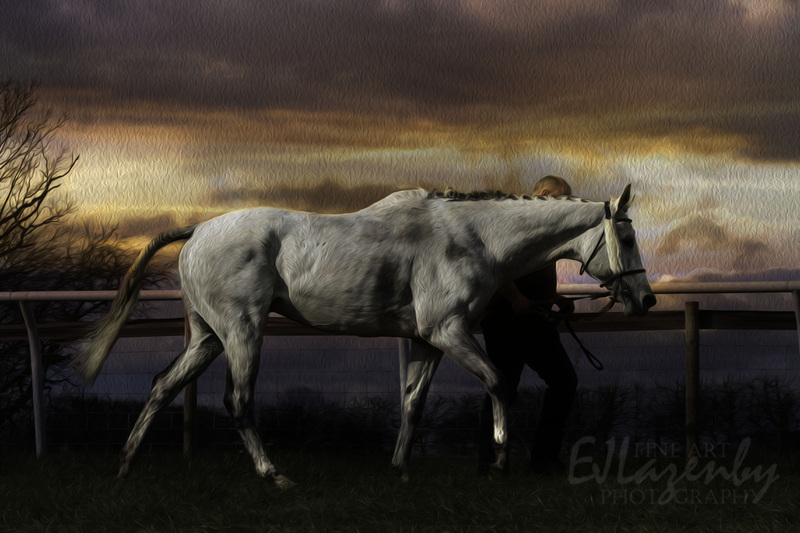 Check out my themed photoshoots - be in your own fairytale with your own horse! 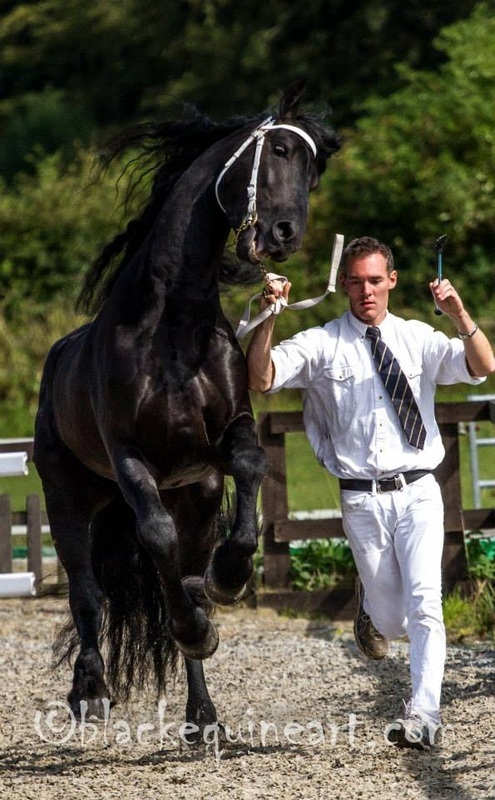 I'm in love with the Friesian Horse! 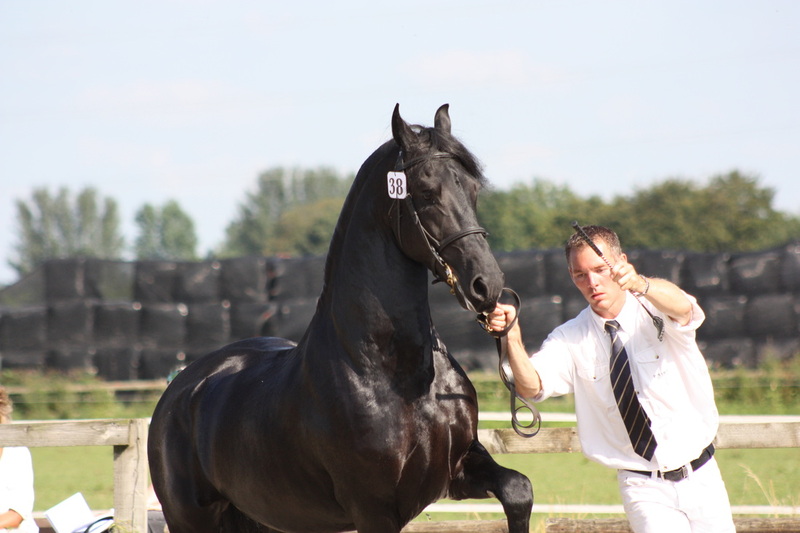 I am now an Accredited Friesian Horse Showing Judge (provisional) with The Friesian Horse Society Of Great Britain and Ireland (FHAGBI). This means my obsession with this fabulous breed of horse now actually entitles me to be in the ring with them.... I do not have a lot of experience at judging at National Level, but I am gaining more knowledge at every opportunity and keen to enchance and progress my skills. I had a wonderful time capturing these black horses both on film and in my sketchbook, look out for more black horses on my easel this autumn! 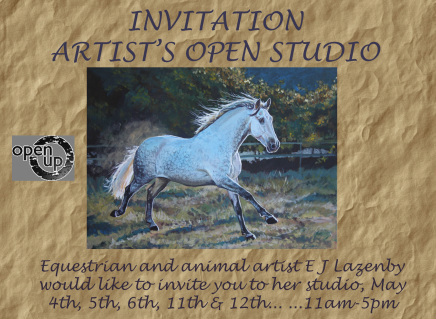 If you are in the area on the 3-5th and 10-11th May, please pop by and see me in my studio.... a very warm welcome awaits! I created this piece of work as a step-by-step teaching aid for Arttutor.com, and in fact it was the first landscape I had attempted in this medium. 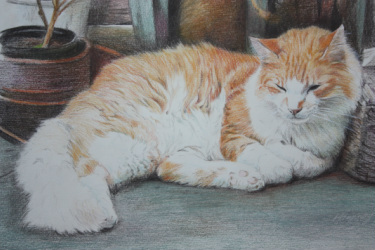 The same piece of work has also been selected by Anne Kullberg (US Coloured Pencil Guru) for inclusion in her self published book 'Hidden Treasures' Masterworks in Coloured Pencil. New work (accepted into The Great Sheffield Art Show).... new prints in two sizes! AUGUST 28th - 30th. 10am - 4pm..... 2 places available. 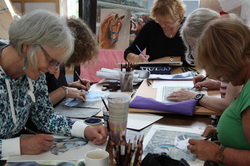 Workshops include individual and group tuition, demonstrations and use of some materials. All refreshments and a hearty sandwich with dessert is included. Off road parking available, only 1 mile from J38 M1 (Yorkshire Sculpture Park Junction). Maximum number of students is 6 to ensure a thorough learning experience. Workshops held in my large purpose built studio at the rear of my home on the outskirts of Barnsley. COSTS: £50 each day. Please email arrkidd@yahoo.co.uk for booking details. It can often be a daunting experience to give your treasured photo to an artist to paint from..Will it look like your animal? What background will the artist choose? Will it be any good? What happens if you don't like it? I offer a 100% satisfaction guarantee that if you are not delighted, you have no obligation to purchase. Things like this are very important as I want you to love and adore your artwork, not to wish that it had more likeness or that the costs were hidden....Here are a couple of examples to show you the original photo and the resulting painting. NEW FOR 2014 - FRIESIAN FETISH - an artistic interpretation of the Friesian horse. 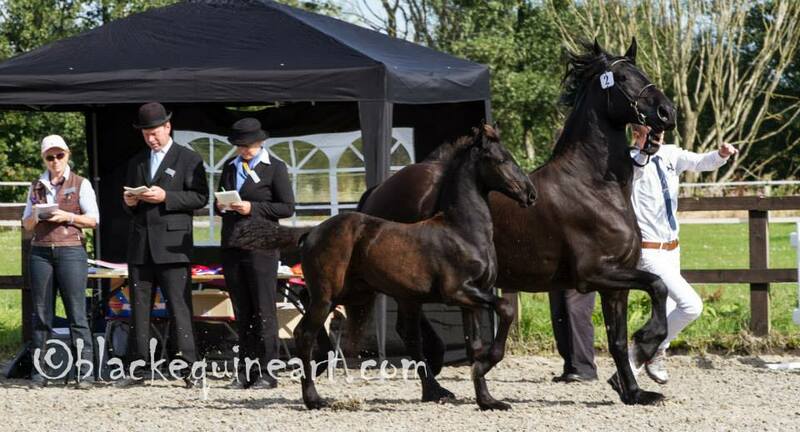 After my visit to Myerscugh, Preston, to witness the 2013 Inspections by The Friesian Horse Association of Great Britain and Ireland (FHAGBI), I came home rather inspired by these majestic and proud black horses. A series of sketches and drawings rapidly flowed out of my painting studio, followed by a photographic calendar. 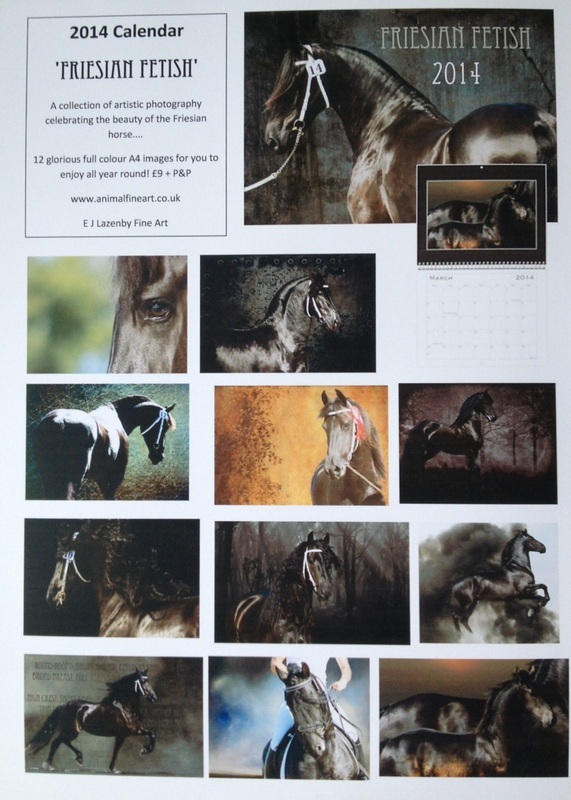 The calendar design is just about finalised and I am happy to take any orders pre-printing. The costs are £9 plus £3.95 p&p, with 20% of all proceeds being donated to Fhagbi. 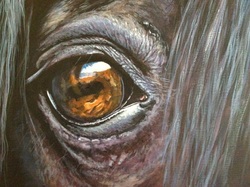 You can now find my work on www.artgallery.co.uk A wonderful selection of art of all styles, sizes and prices! Something for everyone!! Welcome. 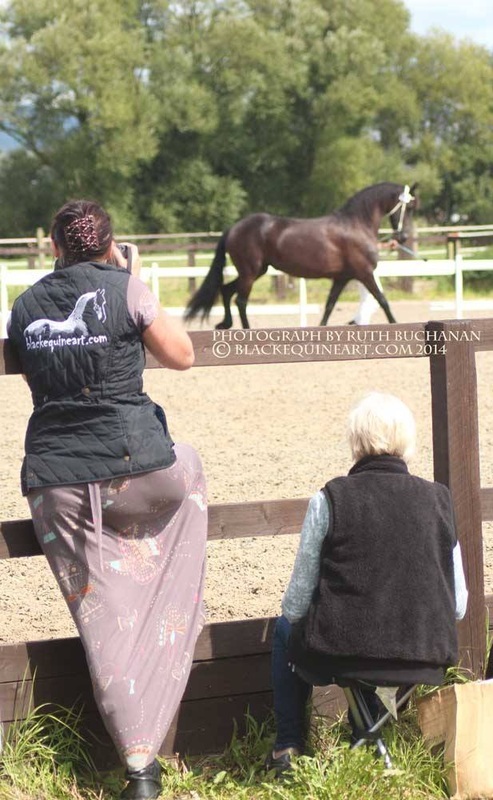 I am an established, internationally exhibited Equestrian Artist based in Yorkshire. 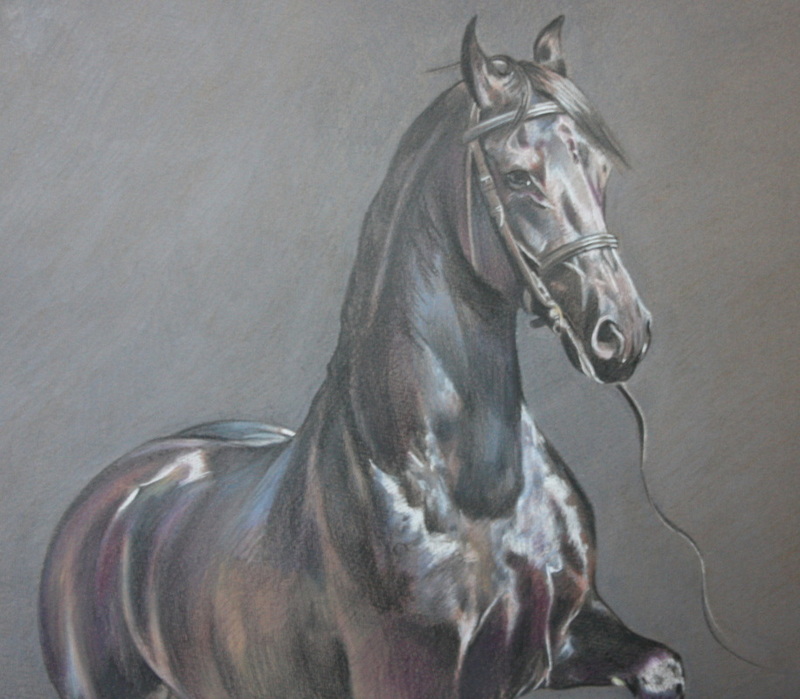 I began specialising in painting horses in 1992 and find it a constant and very enjoyable challenge. I have tried to put together a good, mixed selection of paintings, drawings and photography in my galleries to illustrate my work. My work is mainly equestrian based, but I also enjoy painting dogs, cats, in fact anything from the exotic to the mundane. 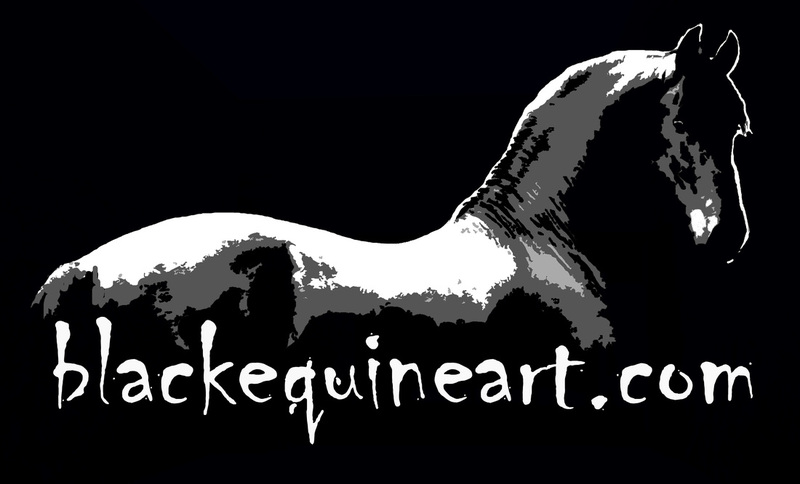 Please take a look through my many galleries of equestrian art and animal fine art. I mainly work in acrylics but can offer a wide range of media for my portraiture. Oh how I like a challenge. Earlier this year I was chatting to a fellow artist (who had also completed the 100 paintings in 100 days challenge) and we were discussing how the challenge had enriched our work. This 'other artist' is Roxanne Gooderham, a highly skilled graphite artist who has recently embarked on oil painting. A couple of months ago I bought my first set of oils since 1989, so it seemed a fine idea to challenge ourselves in the media of oil paints. Due to me breaking my wrist last week, we have slightly downscaled our ambitions to collectively creating 30 paintings - 15 each, posting them for public viewing every other day. This all sounds well and good, but we start on the 1st August!! The 'rules' are that we are creating images of grey and bay horses , the idea is that we can get creative, experiment, try out new ideas and compositions and most of all, realise the potential of oil paints and become more confident within this new (to us) medium..... oh, and have lots of F U N.... Must not forget that bit! 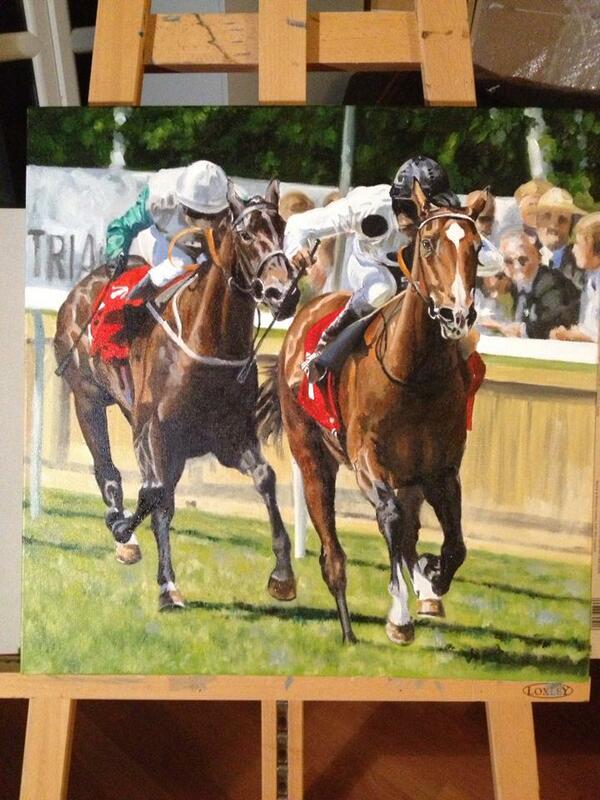 Image: 'Ramiro at Bramham' 2013, my first oil painting since 1989! 'Rammed In', which will be featured at Holmfirth Artweek. Reference pic permission from Jessica Crighton. I have taken 19 pieces to The Cooper Gallery in Barnsley for their Summer Art Sale, all discounted pieces! 13- 27th July. The Great Sheffield Art Show, Sheffield Octagon, 5-7th July. I have 6 pieces of work selected for this prestigious exhibition now in it's 25th year! 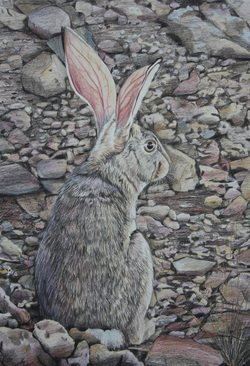 Holmfirth Artweek (main exhibition), Holmfirth Civic Hall, 7-15th July. I've 2 pieces accepted for the main exhibition and I'm also taking a selection of prints and cards. I will have a selection of originals, cards and prints for sale..... Catch me here if you want any FREE photography of your dogs or horses! So I have decided to enter some National and International competitions this summer starting with The Derwent Drawing Prize, over 1,000 pieces are entered in this competition, I'd be happy just to make the shortlist!! The ram painting above, 'Rammed In' won the Wildlife Month of March competition with Great Art......The image opposite 'Hare Today' won the Derwent Pencils Twitter competition..... I was delighted!! for the 4th year running ( see www.openupsheffield.co.uk ). 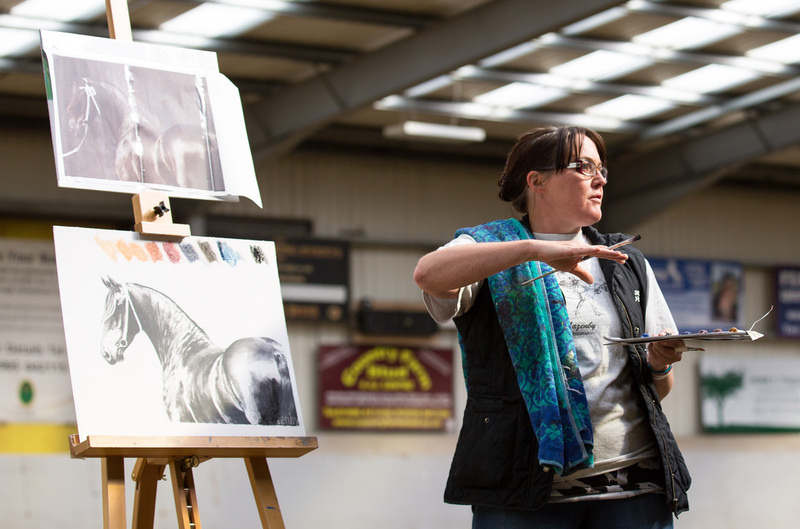 There are over 50 artists participating in a variety of studio locations through Barnsley, Sheffield and Rotherham, so there is a very wide variety of styles, sizes, media and budgets catered for! The event runs Sat 4th, Sun 5th and Mon 6th May, and the following weekend Sat 11th and Sun 12th May. There is no obligation to purchase, but most artists have cards and prints at a fraction of the cost of an original! Are you a budding artist? If you struggle on at home alone without the input from an experienced tutor, this may be for you! 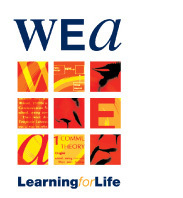 www.arttutor.com again produces a professional selection of e-guides to educate, enlighten and inspire those of us who just love to create! I have had all 4 of my submissions accepted for The Annual Exhibition of The Association Of Animal Artists in Frodsham, Cheshire. 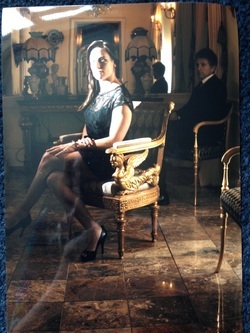 The exhibition will run from the 5th April to the 13th May 2013. This will be the first time I have exhibited with this Society, so I'm looking forward to putting names to faces and seeing what exciting works the other members have created! I'm delighted to have been invited to give a talk at The Cooper Gallery In Barnsley.. I'm a known horse obsessive, it's great to have the opportunity to identify the horses importance in art history from the first cave paintings, through the age of Chivaly, The Renaissance, The Baroque period, The age of Enlightenment, the Romantic period closing in the horse in modern art.... what a journey our beautiful equine has made from the first known artististic daubs into the art of today! It will be fun to share my influences and inspiration with an audience... I hope that they will all return home with a little more appreciation for this magnificent animal! A little bit of what you fancy does you good! FACT....... PROOF? HERE COMES THE CIRCUS ! I'm still accepting orders for that special Christmas gift... BUT YOU WILL HAVE TO BE QUICK!!! I have landed the bestest job in the whole world ever!! I am now one of a small team of established artists demonstrating painting and drawing techniques for the company Art Tutor.com.... 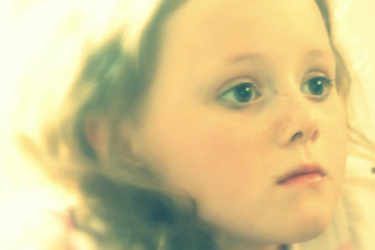 They are based in Liverpool, and I've spent a few fun weekends with them painting to camera, something which I adore... It's rather like being on Blue Peter, and after the first couple of minutes, my nerves disappear and I mutter away happily for hours! I have also completed a number of paintings direct to camera including; Highland Cattle, Chicago Skyline, Wild West, Nevada Desert, plus a number of step by step downloadable guides. My studio is in a mature garden beside my home in Barnsley, Yorkshire in the North of England..... I live barely a mile from the renowned Yorkshire Sculpture Park and I'm lucky to be able to enjoy a superb view across the valley out onto green fields and mature woodland. I am close to junction 38 of the M1, so studio visits can easily be arranged if you prefer to see my paintings 'in the flesh'. Please contact me to confirm a time and date. I'm never one for a quiet holiday just lying on a beach, so when I found out about the artist David McEwan at www.paintfrance.com , I jumped at the chance! 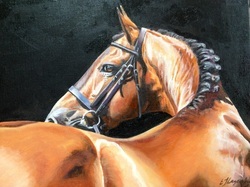 My new work will be headed towards the submission of work with The Society Of Equestrian Artists in London.... Fingers crossed for this one, will keep you informed! All of these new works have French names, left is Ame (soul), probably the softest most detailed painting I have ever created! Big thank you David McEwan for extending my observation and technique! I now hold a regular life drawing class on a Tuesday morning, 10-12. Tuition covers: proportion, form, gesture, energy, negative space, measured drawing, all drawing and painting media. The group is mixed ability and age and has a relaxed and friendly atmosphere.... all welcome! I've entered a 'paint the celeb' competition, the celeb in question is Monique Gadding, an Olympic diver..... I was invited at the painting submission day at Art In The Gardens this June, so I had a look through the offered photographs, and decided it was the time to stick my neck out! The photo I chose, shown to the left, had the most beautiful lighting, even though it was so complex it almost gave me a headache to look at the structure closely! I have posted a few progress shots, and will again post the final completed image for you to see.... if I ever get the thing completed in time! You can see me reflected in the glossy surface of the photo, so the actual image is not as confused as it may seem! What drew me to this image was the lighting; partly bleached out in detail but rich and dark in the shadows... This is a direction that my personal work has been travelling towards over the last year, so it seemed the perfect time to jump ship from animals to people, a subject I find more challenging but just as enjoyable and exciting to work with. The slideshow below shows you the 1 week progress point on this painting... a long way to go as yet! Come and view my paintings in my art studio based in Barnsley near The Yorkshire Sculpture Park. 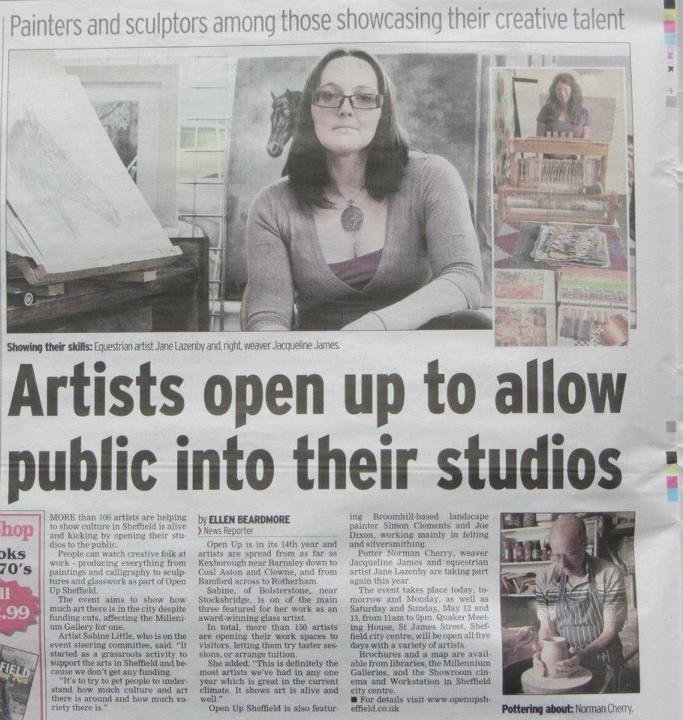 I am part of the Open Studio event for the 4th year running ( see www.openupsheffield.co.uk ). There are over 150 artists participating in 63 studios, so there is a very wide variety of styles, sizes, media and bugets catered for! The event runs Sat 5th, Sun 6th and Mon 7th May, and the following weekend Sat 12th and Sun 13th May. 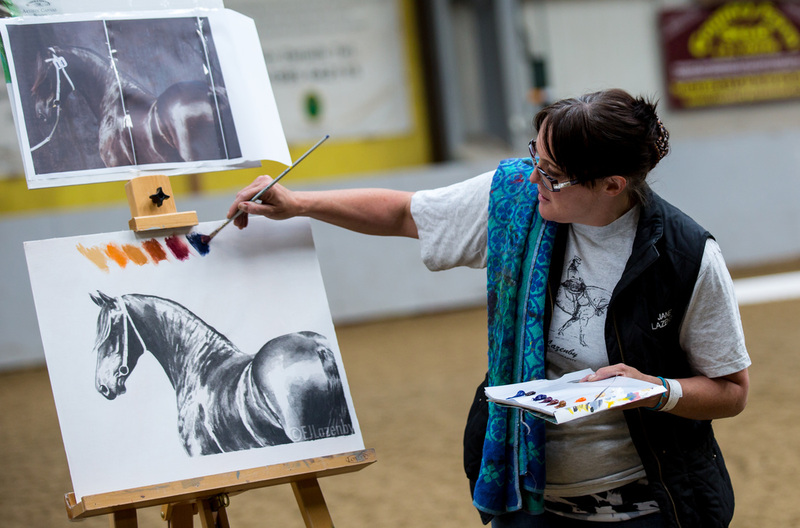 Junior artist moves into the equestrian painting genre. 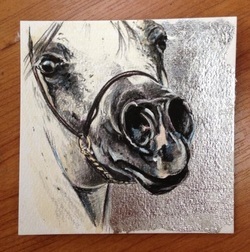 My duracell daughter, now 5 years old, has started her equestrian painting path with this acrylic painting on board, 12 x 12" illustrating her 'bestest ever' hack out with Shelbers, our fantastic little shetland rescue mare. She was very careful to paint in her tabbard slogan 'wide and slow', the actual words should have been gobby and fast, but heck, she's getting there! She's now started to use underpainting and layering, and now can fill in the whole page unprompted... She still nicks my colours though and totally refuses to paint with kids paint- she will only use the £7 a tube variery now! Exhibiting in 'Art In The Garden' at the Botanical Gardens in Sheffield 3-4th. Trade stand at Penistone Show 10th. Shelby and the Junior Artist come home with a red rosette!!! Our first !!! I complete my 100 paintings in 100 days personal challenge. 1st May to 9th August. I become the In House Artist for Newman Embroidery Design Solutions (NEDS) and begin to have some of my work digitised for embroidery designs on their clothing ranges. Also, the 'Shelby' exclusive equestrian designs for kids is launched. Now accepting commissions for Christmas 2011. Make that gift one they will remember forever. QTFE (2) - qualified to teach in further and higher education.